The 36 to Peckham is one of London’s more famous routes, although whether that will remain the case following the loss of its Routemasters remains to be seen! A batch of London Central standard issue Plaxton President bodied Volvo B7TLs was ordered, the type having been used on Sundays for some time in any case; the new buses are supposed to be route bound to the 36, although have already wandered onto other routes in practice. Here PVL 412 (LX54 GZD) passes along Bishops Bridge Road in Paddington on Friday 18 February with a modest load of passengers from Queens Park. Photo © John Nicholas Bennett. A frequency increase upon contract renewal from 9 February 2008 called for some additional new vehicles, and these have belatedly arrived in the shape of Alexander Dennis Enviro400s. E96 (LX08EBV) was seen 15 April 2008 at Victoria, devoid of any adverts in its "premium" gold frames. Quite why a tree deflector is needed on the offside is not clear, and the two of them make you look as if you should be using them to do a bit of abseiling to gain access to the roof! The 36 is another historical service, having run between Hither Green and Queens Park (the traditional name was West Kilburn) for as long as I can trace. The section between Lewisham and Victoria was staunch tram territory for many years, so this is really quite amazing. An early variant in the 1950s was the 36A to Brockley Rise, sharing ground with the 36 between New Cross and Queens Park. At the same time, the 69 bus replaced the 54 tram between Grove Park and Victoria, following the 36 from Catford onwards. About 1960 the 69 was extended to Queens Park via the 36 and renumbered 36B. 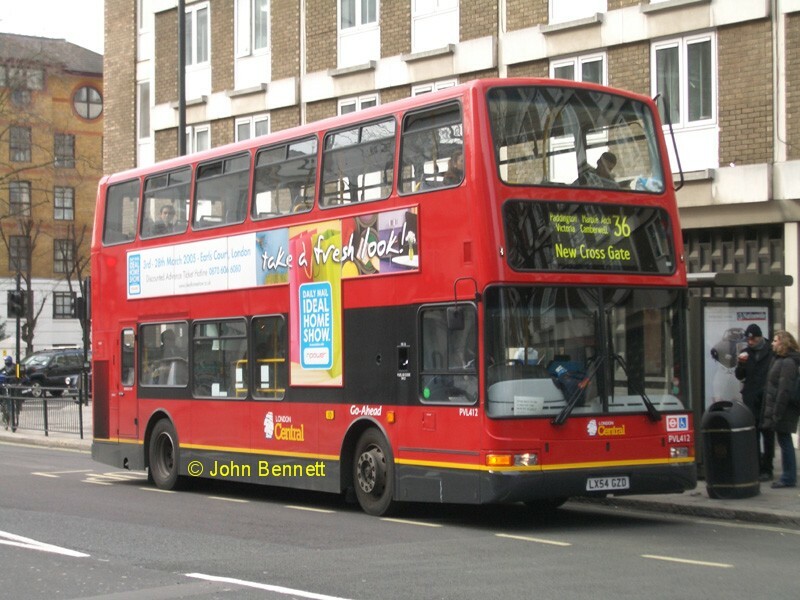 Although the 36A and 36B lost their northern ends, the 36 survived unaltered until April 1991, when the section between Hither Green and Lewisham was transferred to route 180. The 36B was cut back to Peckham and renumbered 136 in the March 1994 scheme. 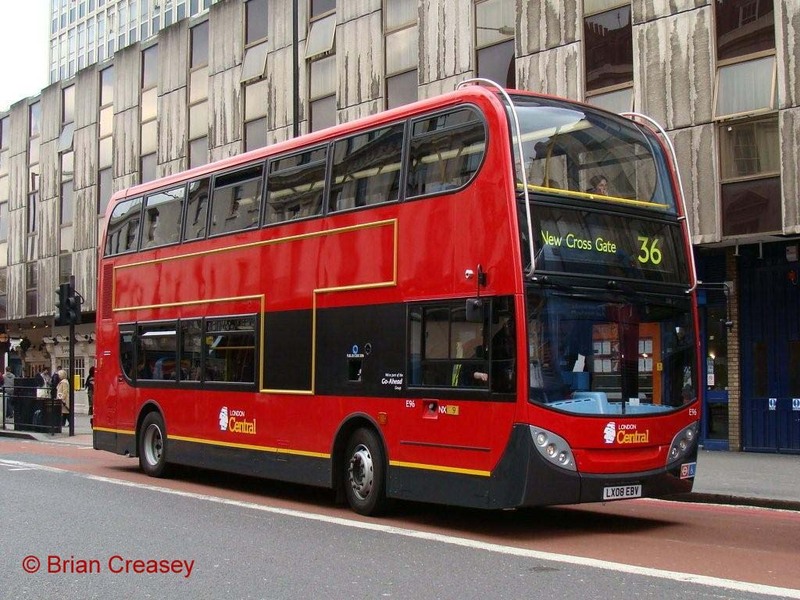 Then from 8 March 2003 the 36 was further shortened to start from New Cross; the outer section from Lewisham to Paddington being converted to cashless articulated buses under the 436 number. Despite this the 36 is quite a long route through some very congested areas of London, with an end to end running time of over one and a half hours. It is also one of very few routes still to cross right through central London, carrying people in from both ends of the route. Ken Glazier suggests that the reason it has survived in this form is that it has generally been worked from garages at the south end – Camberwell, Bromley, Rye Lane, New Cross, Catford, Peckham etc. — although Middle Row did have input at one time. There was no obvious LT garage to operate a route such as Victoria to Queens Park — so the curiosity of garages from south London operating well into north London remains. Nowadays the lack of garages is considered less of an obstacle, with routes such as the 159 having been split despite similar circumstances.